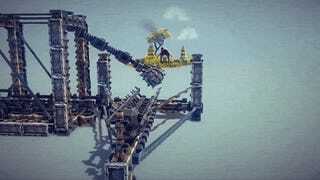 The Besiege community never disappoints when it comes to building deliberately over-engineered siege engines to perform the simple task of eliminating a few knights. David Mcl's Rube Goldberg machine-like bomb delivery system is no exception—it's one of the finest creations I've seen so far. You can follow the bomb's path in the video below.